The Maroon-fronted Parrot (Rhynchopsitta terrisi) is endemic to northern Mexico; specifically they can be found in the Sierra Madre Oriental in Nuevo León, Coahuila and Tamaulipas. 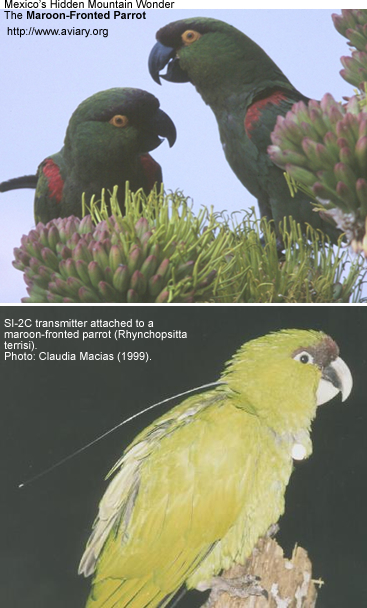 Maroon-fronted Parrots live in mature pine, mixed conifer as well as pine-oak forests - from 2000 to 3500 meters. This bird is considered vulnerable due to overgrazing and habitat destruction. It is estimated that only 2500-3000 birds remain, while 95 to 110 young are produced in a year. This large, macaw-like parrot averages 38 cm or 15.2 inches in length (including tail). The plumage is mostly dark green except of a dark red shoulder and a maroon forehead an eye-stripe. It wings and tail appear to be black when it is in flight. It makes a high, rolling cr-a ak sound. Flocks of them sound similar to the Acorn Woodpecker heard from a distance. They nest in limestone cliffs near moving water in large colonies. These juveniles fledge around November. They migrate over short distances seasonally.